Glycol water chiller is also called Air cooled low temperature chiller, these chillers are widely used in plastic industry, electrons, plating, chemical industry, ultrasonic wave cooling, printing and others. This kind of air cooled industrial chillers can precisely control the temperature requested by the modernized machinery production, and it greatly improved the production efficiency and quality. AC+ air cooled glycol chiller doesn't require cooling tower, which is easy to install and remove. Original famous brand Semi-hermetic piston compressor adopted, features sufficient cooling capacity, stable performance, and excellent quality. Electric components ensure the chiller unit running stably with long service time. Equipped famous brand water pump, with large flow, high efficiency and durability. Compact design, easy to install and operate, convenient to clean and maintenance. High efficient shell and tube evaporator adopted, ensuring high cooling efficiency. Aluminum fin condenser---air cooled type. Shell and tube condenser— Water cooled type. 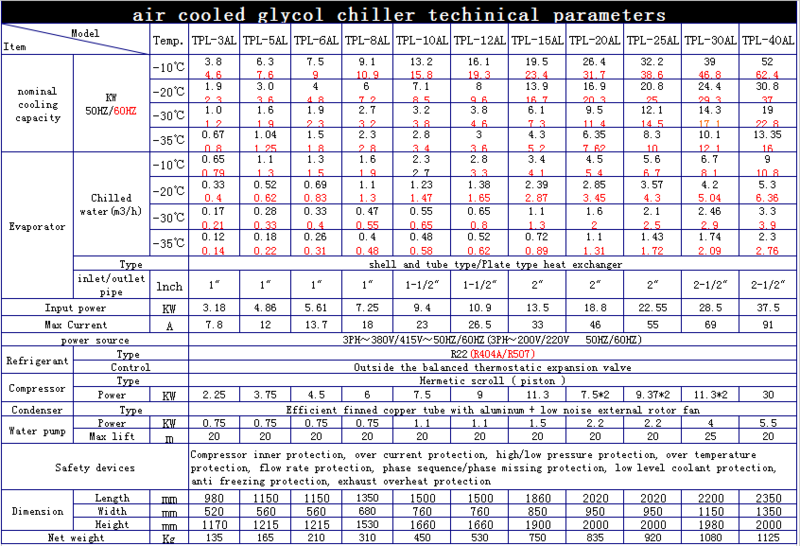 R22, R404A refrigerant for option. 380V-415V/50Hz 3pH for standard design. Different design available on request. 1, Chilled water inlet/outlet temperature difference 3℃/8℃.